Official College portrait of James Armstrong from the Middlebury College archives. Middlebury College today mourns the passing of James Isbell Armstrong, the 12th president of the College from 1963 through 1975. Dr. Armstrong, who died earlier this morning, December 16, with his loving wife, Carol, and family members by his side, was 94 years of age. Armstrong served as president during one of the most turbulent periods in U.S. history, a time marked by war abroad and assassinations at home, when American streets served as battlegrounds in the fight for civil rights and as a stage calling attention to a cratering global economy. On campus there was unrest, social change, and financial stringency. And yet when James Armstrong left office, he had done nothing less than establish Middlebury as one of the top liberal arts colleges in the country. During his presidency, Armstrong instituted the first tenure system at Middlebury, initiated a faculty research fund, created a professional leave program, enlarged the size of the faculty, increased faculty salaries, reduced teaching loads, and had a direct hand in shaping curriculum and academic policy, recalled Victor Nuovo, the Charles A. Dana professor emeritus of philosophy. Born and raised in Princeton, N.J., Armstrong prepared for college at the Taft School in Connecticut and returned home in 1937 to enroll at the university where his father, William P. Armstrong, was a member of the faculty. James Armstrong graduated from Princeton, Phi Beta Kappa with a major in classics, just a few months before the Japanese attacked Pearl Harbor. He enlisted in the U.S. Army in 1941, served with Army Intelligence in the Pacific, and rose from the rank of private to captain. He was awarded the Bronze Star for meritorious service and was discharged in 1946. Armstrong was called back into uniform in 1951–1952 for the Korean War. Between the wars he was awarded a Woodrow Wilson National Fellowship and earned a PhD in Greek literature from Princeton in 1949. His dissertation was titled “The Trierarchy and the Tribal Organization of the Athenian Navy.” While pursuing his doctoral studies, Armstrong discovered his love of teaching Greek to undergraduates and his passion for sharing the intricacies of Homeric literature. He held instructor positions at Princeton and Indiana University before accepting his alma mater’s offer of an assistant professorship in the classics department in 1954. He subsequently was appointed assistant dean of the graduate school and was later promoted to associate professor and associate dean of the graduate school. 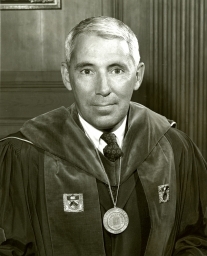 In 1963, as Middlebury’s 11th president, Samuel Stratton, was preparing to step down from office, the Board of Trustees’ search committee, chaired by L. Douglas Meredith, approached the 44-year-old Armstrong. In his inaugural address, delivered on November 8, 1963, Armstrong said: “There is no room in this hour of man’s history on earth for luxury education with finishing-school overtones, for fads, frills, and fringes.…What is at stake here at Middlebury is the importance and relevance of the liberal arts and liberal sciences—here and now—in the space-atomic-computer-satellite age—this age of segregation and inequality, persecution and intolerance, prejudice and provincialism—yet at the same time this age of social and moral concern, of internationalism and cooperation, of gigantic strides in understanding through communication." Though capital projects may have been the most visible campus changes during Armstrong’s tenure, he had just as great an impact in other arenas, as well. The summer language programs expanded to include schools in Chinese (1966) and Japanese (1970), while the Language Schools and Schools Abroad added courses at the undergraduate level when, heretofore, coursework had been for master’s and doctoral degree candidates only. In addition, Armstrong and the trustees launched the 175th Anniversary Campaign in 1971 with the goal of raising $10.5 million. At its conclusion, the campaign had raised more than $13.8 million. In the fall of 1974, Armstrong informed the trustees of his intention to resign on September 1, 1975, to become the president of the Charles A. Dana Foundation. In 1999 James and Carol Armstrong returned to Middlebury for the dedication of the James I. Armstrong Library, the College’s science library located on two floors inside the magnificent, new Bicentennial Hall. In 2010 the College established the James I. Armstrong Professorship in Classical Studies in honor of Armstrong and his lasting and far-reaching contributions to Middlebury. The professorship—made possible by a gift from Carolyn and Milt Peterson, Class of 1958, and their family—is held by Professor of Classics Jane Chaplin. The Armstrongs raised three children: the late Carol, or “Cary,” who married Roth “T” Tall ’65 and had three sons, Christopher, Jamieson, and the late David; James I. Jr., the director of choirs at the College of William and Mary, who is married to Jamie C. Bartlett, the associate director of choirs at the same institution, and who has two children, Robert and Caecilia; and Elizabeth Armstrong, associate professor of East Asian studies at Bucknell University, who is married to Erik Lofgren, also an associate professor of East Asian studies at Bucknell, and together they have two daughters, Rebekah and Mariah. A memorial service will be held on Saturday, January 11, 2014, at 2 p.m. at Kendal at Hanover. Memorial donations may be made to the Cadbury Fund of Kendal at Hanover (c/o Brent Edgerton, associate executive director) or Middlebury College.